Following the Punic Wars, Rome set out to consolidate the territories it had captured beyond the Alps. 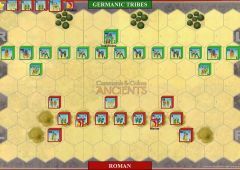 At the same time, a major migration by the Cimbri, Teutons, and Ambrones, under the Kings Boiorix and Teutobod, was moving south, reportedly with over 200,000 men (more likely the fighters numbered about 50,000). Two Roman armies were sent to stop this migration with nearly 80,000 legionnaires. 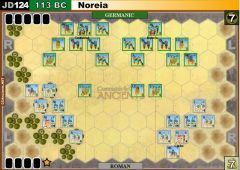 However, bitter differences between the Consul Gnaeus Mallius Maximus and the Proconsul Quintus Servillius Caepio prevented the two Roman armies from cooperating, with devastating results. The Roman forces were camped by the Rhone River, near Arausio (modern Orange). However, the armies did not camp together. 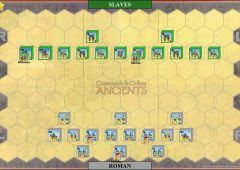 Caepio made his camp closer to the enemy (seeking to rob Maximus of the victory) and his dispositions are shown on the battlefield (Maximus and his army have made camp off map). 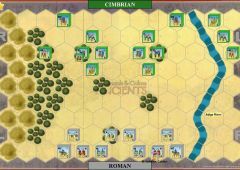 The sight of two Roman armies made Boiorix cautious, and he entered into negotiations with Maximus. Caepio, motivated by hatred and envy of Maximus, foolishly launched a hasty attack on the barbarians. Caepio’s army was annihilated in this piecemeal assault. 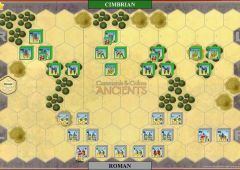 With a boost in confidence from this easy victory, the barbarians proceeded to advance, pin Maximus’ army against the river, and destroy it also. 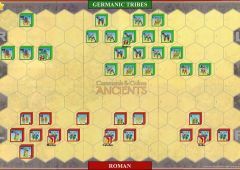 In terms of human lives lost, Arausio was among the most lethal battles in world history, and Rome’s worst defeat since Cannae. 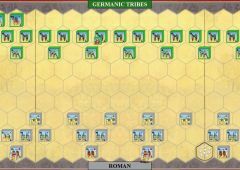 The terrible defeat had one beneficial result for Rome. It gave Gaius Marius the opportunity to come to the fore and radically reform the organization and recruitment of Rome’s legions. • The Rhone River is impassable. 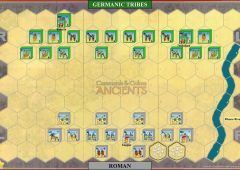 • A Germanic Tribe unit that occupies an enemy camp hex at the start of the Germanic player’s turn may remove the camp hex and gain a Victory Banner that cannot be lost. Remove the camp hex before playing a Command card.